Total Lunar Eclipse, June 15 2011. The results! It was a thriller! Here in Nicosia we lost the phenomenon up to totality due to thick clouds & fog, occasionally getting glimpses through holes in the clouds. Halfway through the event the skies gradually opened and we got to witness the exit from totality all the way to the end! I had arranged to meet with Pampos & the others at Akropolis Park so we could set up our joined equipment: My CG5 mount with Pampos's Vixen ED81S & 450D. Due to the clouds we were unable to get a decent polar alignment or even get the focus right which resulted in mostly soft images up to mid-totality. Once the skies opened I was able to fix the focus and we enjoyed the end of the eclipse with decent results! On June 15 we will have the opportunity to observe a Total Lunar Eclipse which will be fully visible from Cyprus! The fact that it occurs in mid-June promises great weather conditions (although this year the weather has been unpredictable!). The Moon will start its pass through the Earth's penumbral shadow at 17:23 UT (20:23 Local Time) although this part will not be visible to the naked eye. At 18:22 UT (21:22 Local Time) the Moon will begin to darken as it enters the Earth's umbral shadow thus marking the beginning of the visible part of the eclipse. Greatest eclipse occurs at 20:12 UT (23:12 Local Time) and at this stage the Moon is expected to have darkened considerably as it will now be passing through the center of the Earth's shadow. At 21:03 UT (00:03 Local Time) the whole process goes backwards with the Moon beginning to exit the Earth's shadow marking the end of the visible part of the phenomenon at 22:02 UT (01:02 Local Time). The entire phenomenon ends at 23:02 UT (02:02 Local Time). Here you can find all the relevant info for the phenomenon. 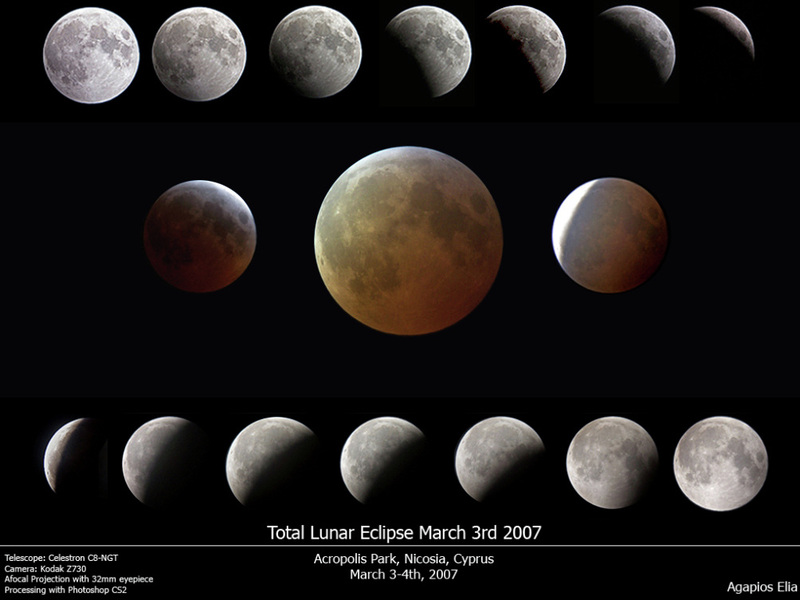 Below are the images from the March 3rd 2007 Total Lunar Eclipse.